If your first step is wrong, the whole journey will be wrong. World over an emphasis is put on beginnings. Getting off to a good start is essential, as the beginning is the foundation upon which everything that comes after rests. Indian culture, perhaps more than any other, stresses the importance of beginning things properly. The position of the stars and planets is taken into consideration to insure auspicious beginnings, homas are performed and stotrams are chanted to Lord Ganesha in order to remove potential obstacles before the start of any undertaking. Prayers to God are always offered. Even when studying the Upanishads, which declare the only true power to be our own Self, shanti mantras are chanted before beginning each session of study. Ultimately, all these are ways of humbly admitting our finitude, the limited nature of our efforts, and are a means of supplicating to the Divine for favourable outcome. As Amma says, “Grace alone is the deciding factor”. By taking into consideration even subtle nuances beyond our intellectual understanding when we begin a project, we are both showing the sincerity of our effort as well as our faith in the words of the scriptures and the Guru. In Kerala, the start of the Zodiac New Year*—when the sun enters into Sidereal Aries, Ashwini nakshatra—is celebrated as Vishu. It is said that what one sees when one first opens one’s eyes on Vishu morning is an indication of what one can expect in the year to come. Thus on Vishu, effort is made to assure one opens one’s eyes before an auspicious image—the Vishukkani. While the festival is called “Vishu” only in Kerala, across India festivals sharing the same spirit—such as Ugadhi in Andhra Pradesh and in Karnataka, Gudi Padwa in Maharashtra, Bihu in Assam and Baisakhi in Punjab—are celebrated around the same time of year. The Malayalam word kani literally means “that which is seen first”, so “Vishukkani” means “that which is seen first on Vishu”. 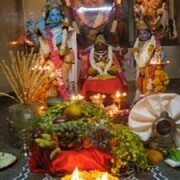 Arranged in the family puja room the night before by the mother in the family, the Vishukkani is a panorama of auspicious items, including images of Lord Vishnu, flowers, fruits and vegetables, clothes and gold coins. Lord Vishnu, the preserver of creation, is the aspect of the Paramatman that is focused upon during Vishu. In jyotish, Indian astrology, Vishnu is seen as the head of Kaala Purusha, the God of Time. 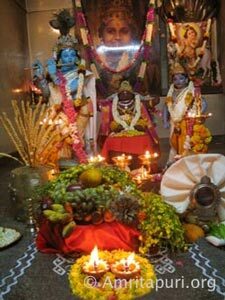 As Vishu marks the first day of the Zodiac New Year, it is an appropriate time to offer oblations to Lord Vishnu. Akshatam, a mixture of rice and turmeric, which is divided into halves of husked and un-husked rice, is placed in a special bowl called an uruli. The uruli traditionally is made of panchaloham, an aggregate of five metals. Panchaloham being symbolic of the universe, which is comprised of the five great elements—earth, water, fire, air and space. A nice, well-starched cloth is then pleated fan-like and inserted into a highly polished brass kindi (a spouted puja vessel used for pouring sacred water). The val-kannadi, a special type of mirror with an extremely long and thin handle, often decorated with gold, is also inserted into the kindi. The kindi is then placed in the uruli on top of the rice. Two deepams, which are fashioned from the two halves of a split coconut, are also kept in the uruli. The wicks are made from pieces of starched cloth that are folded into bulbs at the base. These bulbs are placed into the coconut oil that fills the deepams, anchoring the wicks in place. The starch helps the rest of the wick to extend straight upwards so that they will properly burn. The lighting of the deepam welcomes God into our lives and is also symbolic of spiritual knowledge—the remover of the darkness of ignorance. Gold—both in colour and in coin—is central to the Vishukkani. Kanikkonna, a golden-yellow flower associated with Sri Krishna is used liberally throughout the puja room. This flower only blooms when the sun is in its most exalted position astrologically—the month surrounding Vishu. In the puja room, the flower verily represents the sun itself, the eyes of Lord Vishnu. Gold coins are symbols of monetary affluence, as well as cultural and spiritual wealth, which the elders of the family must share freely with the younger generation. Vishukkaineettam, the distribution of wealth, is another aspect of the festival. It should be given freely and accepted with reverence. On Vishu, the highly affluent families will not only give money to their children but also their neighbours, perhaps the entire village. 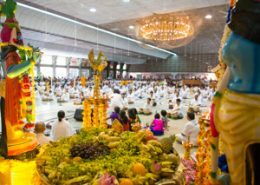 The Vishukkani will also be laden with gold-coloured fruits and vegetables, such as bananas, jackfruit, golden cucumber, etc. The akshatam, as it is full of turmeric, also is gold in colour, as is the shiny brass of the kindi, the panchaloham and the reflection of the mirror. Last but not least, a spiritual book, such as the Bhagavad-Gita, should be made part of the arrangement. The book is the pramanam—the instrument used for attaining the eternal, non-perishable wisdom of the Rishis—as well as a symbol of that knowledge itself. Upon opening one’s eyes, one is overwhelmed with the glorious darshan of the Lord. The mirror—which is symbolic of Bhagavati (Devi), not only increases the lustre of the Vishukkani via the reflection it offers, but also shows our own face, reminding us that God is not someone sitting in the heavens upon a golden throne, but the pure consciousness that is our true nature. The mirror also points to the importance of making our mind pure enough to render this truth unadulterated. The Vishukkani is not reserved only for those who come to the puja room, but is taken around—for the viewing of the elderly and sick who are perhaps too frail to come to the shrine. It is also brought outside and shown to the family cows. As it is brought to the cowshed, it in fact is on display for the birds, the trees, for all of nature to see. Vishukkani points to a year of abundance—both spiritually and materially. Food, light, money, knowledge—all should fill our life. Taking in the Vishukkani we should pray that the vision remains with us throughout the year. It is not enough that the joy we take from viewing the Vishukkani comes only to our eyes. It must reflect in our thoughts and in our actions. The auspicious start of the year—which has come to us due to the grace of beginning it with a divine vision—is not for us alone. It is up to us to spread this love, happiness and hope to the rest of society. *It is not the Solar New Year—the day when the sun crosses the equator, heading northward—a common misconception. It is possible that this confusion has arisen due to the fact that in Kerala the Vishu celebration originated about 1,654 years back. At that time, the Solar New Year took place at the same time as the Zodiac New Year. But where the Zodiac New Year is a constant, the Solar New Year is changing at a rate of one degree every 74 years.